I really like electrolysis. Today I bought 30% sulphuric acid to electroplate something with pieces of copper. I've poured half water and half acid in a glass. I connected some cuprextit-copper plate to the anode and outdated aluminium coin to the cathode. After starting the process, I could see that nothing is appearing on the cathode. I scratched the aluminium of the oxides. After repeating the electrolysis, aluminium turned black wherever scratched. Then I found out I swapped the wires. The dust can be easily washed off. According to the image from wikipedia, any metal should be "electroplateable". I actually thought that any conductor that doesn't react with the solution can be electroplated. So what's the reality? Was I just impatient? Is electroplating only limited to some conductors? What about non metal ones? Can I electroplate carbon electrode? 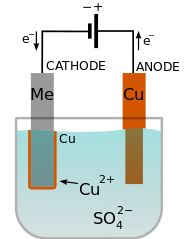 While you can use basically any conductive material as an electrode to reduce the metal ions in solution, to actually plate the electrode with the metal, the metal has to be able to attach to the surface. If you have contaminants like surfactants, it can prevent deposition. The trouble with using aluminum as a cathode is that it readily forms an oxide layer that can be difficult to stick things to. I understand that it's possible to electroplate copper onto aluminum, but it's usually done with copper cyanide baths, so you may find it easier to plate copper onto steel or nickel. The other issue is that reduction of the copper ion is not the only possible reaction at the cathode. If your voltage is too negative, you may get significant hydrogen evolution and the bubbles will prevent a solid film from adhering properly. (which looks like it may be the problem in your photo) What you want is to deposit very slowly by keeping your voltage down so that you minimize gas evolution, though you may still have trouble with an aluminum cathode. As to the sorts of things that can be electroplated, many metals have similar behaviour where it's possible to produce quite high quality films of a second metal over top. Other metals like mercury and bismuth tend to form alloys or intermetallic compounds. It is certainly possible to deposit thin metal films on materials like indium tin oxide, graphite or glassy carbon, thought adherence can be a problem. Can I perform electroplating with sodium carbonate and copper? Why does the concentration of hydrogen ions increase in the electrolysis of dilute sulphuric acid? In an Electrotlytic cell using MgSO4 electrolyte, Cu(OH)2 and Mg(OH)2 are visible products, Where Does SO4 go?